Some of the most beautiful and elegant mushrooms on earth, in my opinion, are included among the "mycenoid" species--those that used to belong in the Friesian genus "Mycena." Most of the species are extremely small mushrooms, rarely exceeding a few centimeters in diameter and often only reaching diameters of a few millimeters. They are frequently overlooked, unless they happen to be growing in large clusters. But for those who are willing to slow down and appreciate the beauty of small things, they can be quite stunning. The tell-tale characteristics of this group include a white spore print, a small conical or bell-shaped cap, and a thin stem that is not tough or wiry. A few species, like Mycena leaiana, are brightly colored, but many are gray, brown, or whitish. Alexander Smith's 1947 monograph of Mycena (online here) contains 232 North American species, and the number of mycenoid species has only increased since. Many North American mycenoid mushrooms are currently going under European names--a situation that is likely to change when someone's dissertation involves a DNA study of North American and European collections. For the time being, however, we are left with a sixty-year-old treatment and a lot of species requiring microscopic observation for successful identification. Careful observation of what it is, exactly, that these little saprobes are decomposing is crucial to successful identification of mycenoid mushrooms. Many species grow in clusters on decaying stumps and logs, while others arise from debris on the forest floor or from the bark of living (or recently dead) trees. A few play very specialized ecological roles; Mycena luteopallens, for example, arises from the nut shells and nuts of hickories and walnuts. You will often need a fairly large collection of mycenoid mushrooms to work with in order to adequately assess many of the features that are crucial to identification. Odor is often very important, and is best determined by taking a complete cap and squeezing it into mush between your thumb and forefinger, then taking a whiff. Distinctive odors in the group include bleachlike, radishlike, iodinelike, and mealy smells. Physical features frequently used for identification of mycenoid mushrooms include colors of the cap, stem, and gills; the manner in which the gills are attached to the stem; whether the edges of the gills are the same color as the faces; whether the fresh stem exudes a juice when squeezed or sliced; whether the stem surface is sticky or not; the shape of the cap; and details regarding the base of the stem. Many of these features, however, are somewhat variable, and can change between button stage and maturity--another reason a large collection, representing all stages of development, is often necessary. Microscopic features are usually crucial for identification. Most of the important microscopic details (basidia, cheilocystidia, pleurocystidia, and pileipellis) can be observed with a successful Roman aqueduct section mounted in 2% KOH with a phloxine stain. Spore observations should be made in a Melzer's reagent mount to assess whether the spores are amyloid or not. While most mycenoid species have amyloid spores, they are not as strikingly amyloid as, for example, the amyloid spores of some Amanita species--and the amyloidity usually fades as the spores age and mature, so that many spores in a mount are inamyloid. Some mycenoid mushrooms, however, have truly inamyloid spores (these are often yellowish in Melzer's), so careful assessment is required. DNA studies that have included mycenoid specimens have made it fairly clear that what we are now calling the genus "Mycena" represents a pretty incoherent group of genetic entities, and we will eventually wind up with several genera and a much smaller genus Mycena, centered around the type species of Mycena, Mycena galericulata. Believe it or not, Panellus stipticus is apparently more closely related to some of the mushrooms we currently place in "Mycena" than many of the other species we assume to belong in the same genus! Other mycenoid (or sometimes-mycenoid) genera include Hemimycena, Hydropus, Roridomyces, Rickenella, and several others. 1. Mushroom with interesting features not requiring a microscope to observe or detect: a distinctive odor (mealy, bleachlike, radishlike, etc. ); a stem that exudes a white or colored latex when crushed or sliced; a tiny basal bulb or disc at the base of the stem; a stem that is sticky or slimy when fresh and young; or colors (anywhere on the mushroom) that are not some shade of brown, gray, black, or white. 1. Mushroom boring without a microscope. 2. Mushroom with a distinctive odor (crush an entire fresh cap). 2. Mushroom boring to the nose. 3. Odor bleachlike, mealy, unpleasantly cucumberlike, strongly fragrant, or reminiscent of iodine. 5. Gill edges colored like the faces. 5. Gill edges notably darker than the faces. 6. Stem usually yellowish to yellow, at least near the apex; spores 8-10 µ long. 6. Stem without yellow shades; spores 5.5-7 µ long. 7. Fresh cap more highly colored. 8. Known from the Pacific Northwest, under western redcedar; cap convex; spores 5-7 µ long. 8. Widely distributed in North America; cap usually bell-shaped; spores usually longer than above. 9. Mature cap 2-6 cm across. 9. Mature cap usually under 2 cm across. 10. Cheilocystidia with numerous rodlike projections; cap dark to dull brown or grayish brown; cap and gills sometimes developing reddish spots. 10. Cheilocystidia fusoid-ventricose, without rodlike projections; cap grayish brown, purplish gray, or sometimes reddish; cap and gills not developing reddish spots. 11. Odor bleachlike or reminiscent of iodine. 11. Odor mealy, unpleasantly cucumberlike, or strongly fragrant. 12. Growing from litter on the forest floor. 12. Growing from stumps and logs. 13. Odor reminiscent of iodine; cap 2 cm across or smaller; cheilocystidia saccate with numerous spinelike projections. 13. Odor bleachlike; cap variously sized; cheilocystidia fusoid-ventricose, without spinelike projections. 14. Cap black to dark brown, fading to grayish brown, 1-4 cm across. 14. Cap whitish, usually under 2 cm across. 15. Cap grayish, soon fading to pale gray or whitish, often large (up to 7 cm across); cystidia fusiform and often elongated (up to 90 µ long). 15. Cap more or less brown to grayish brown, up to 4 cm across; cystidia shorter than above, fusiform or clavate to saccate or irregular. 16. Densely clustered on the wood of hardwoods; gills broadly attached or beginning to run down the stem; cystidia inconspicuous, club-shaped, broadly fusoid-ventricose, saccate, or irregular; spores 4-5 µ long. 16. Gregarious or loosely clustered on the wood of conifers; gills usually attached by a tooth; cystidia more or less fusoid-ventricose; spores 7.5-11 µ long. 17. Odor strongly fragrant (reminiscent of the odor of Tricholoma magnivelare); cap olive brown to brown; cheilocystidia with long (15-30 �), needlelike projections; growing on the debris of hardwoods or pines in eastern North America, in fall. 17. Not completely as above; odor mealy to strongly cucumberlike. 18. Odor strongly cucumberlike; cap tiny, grayish to brownish; stem usually slimy; growing on conifer duff. 18. Odor mealy; cap size and color various; stem not slimy; ecology varying. 19. Mature cap 2.5 cm across or smaller; cap whitish, or gray to black. 19. Mature cap 1-6 cm across; cap brown to yellowish brown or yellowish. 20. Cap whitish; growing on logs or debris of both conifers and hardwoods. 20. Cap black to gray; growing on the ground on conifer debris. 21. Young cap margin usually adorned with tiny "teeth"; stem yellow above, brown to reddish brown below; odor strong. 21. Young cap margin even; stem tan to brownish overall; odor not strong. 22. Blue shades present somewhere on the mushroom. 23. Stem 0.5-1 mm thick; blue shades in cap mixed with black to gray. 23. Stem 1-3 mm thick; blue shades in cap mixed with browns. 24. Cap black to dark gray overall; cystidia fusoid-ventrocise, without rodlike projections. 24. Cap gray (usually paler than above) overall; cystidia with numerous rodlike projections. 25. Growing on the deadwood or woody debris of hardwoods; spores subglobose. 25. Growing on the deadwood of conifers; spores ellipsoid. 26. Fresh stem exuding a white, yellow, orange, red, or purple juice when sliced or squeezed. 26. Fresh stem not exuding juice, or "juice" merely watery. 27. Juice more highly colored. 28. Taste mild; cap usually black to gray, not reddening. 28. Taste very bitter (like quinine); cap usually some shade of brown, often reddening. 29. Gill edges colored like the faces. 29. Gill edges notably different in color from the faces. 30. Fresh cap brownish gray; juice yellowish orange to purplish orange; found on decaying leaves of beech; cheilocystidia clavate, with rodlike projections. 30. Fresh cap purplish red; juice reddish to red or purplish red; ecology various; cheilocystidia without rodlike projections. 31. Found on the deadwood of various hardwoods (and occasionally on conifer wood); mature cap convex, broadly bell-shaped, or broadly conic. 31. Found on the deadwood of quaking aspen or alder; mature cap sharply conic, with a narrowed point. 32. Gill faces pale yellow, edges maroon; upper stem surface adorned with tiny reddish fibrils; juice yellow to orange; found on the litter of oaks or beech. 32. Gill faces whitish to pinkish or grayish; upper stem surface naked; juice variously colored; usually found on litter of conifers or West-Coast hardwoods. 33. Cap reddish brown, soon developing yellow hues; juice pale reddish to yellowish; pleurocystidia absent; found under Sitka spruce and Douglas-fir in the Pacific Northwest. 33. Cap bright to dull reddish brown, without yellow shades; juice darker red than above; pleurocystidia present or absent; distributed in various North American ecosystems. 34. Growing on terrestrial debris of conifers across North America; cheilocystidia fusiform to fusoid ventricose. 34. Growing on terrestrial debris of coast live oak and other hardwoods on the West Coast; cheilocystidia clavate to irregular, with fingerlike and rodlike projections. 35. Base of stem terminating in a small bulb, or in a small disc; mushroom tiny (mature cap to 10 mm across). 35. Base of stem not as above; mushroom variously sized. 36. Growing on the dead leaves of salal; cap yellowish brown; stem yellowish; bulb at base of stem orangish yellow; known from the Pacific Northwest. 36. Ecology not as above; cap, stem, and bulb gray to brown or whitish; variously distributed. 37. Cap and stem very finely hairy when young (use a hand lens); very long setae present; spores inamyloid; mature cap to 5 mm across. 37. Cap and stem either bald or very finely granulated (not hairy; use a hand lens); setae absent; spores at least weakly amyloid when immature; mature cap 4-15 mm across. 38. Cap bald, 3-15 mm across when mature; cheilocystidia with a few fingerlike projections and/or nodes. 38. Cap covered with fine granules, 2-6 mm across when mature; cheilocystidia fairly densely covered with bumps or rodlike projections. 39. 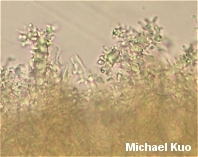 Growing on plant debris (including fern leaves in greenhouses) or needle duff; stem 20-30 mm long; cheilocystidia densely bumpy but without rodlike projections. 39. Growing on woody debris or moss-covered tree trunks; stem 5-15 mm long; cheilocystidia smooth or densely bumpy, with rodlike apical projections. 40. Fresh stem notably sticky or slimy when mushroom is picked; fresh cap often (but not always) sticky to slimy as well, often with a tough, separable "skin." 40. Fresh stem and cap not as above. 41. Growing on the terrestrial debris of conifers; fresh stem thickly slimy with a gelatinous sheath but cap dry; cap to 15 mm across, grayish to brownish, becoming whitish; pileipellis hymeniform. 41. Not completely as above. 42. Cap some shade of yellow; gills lilac to purple, running down the stem; growing on the wood of conifers; hymenial cystidia absent. 42. Not completely as above. 43. Cap some shade of orange, yellow, green, or brown. 43. Cap whitish, gray, or blackish. 44. Cap, gills, and stem some shade of orange; gill edges notably darker than the faces. 44. Orange colors absent; gill edges colored like the faces. 45. Cap, gills, and stem fairly bright orange throughout development; found throughout eastern North America. 45. Cap whitish when young, developing brownish, grayish, and orange hues; stem and gills orangish; found from Texas to Florida. 46. Cap olive brown to brown; cheilocystidia with long (15-30 µ), needlelike projections. 46. Cap green to yellow-green, yellow, or brownish yellow; cheilocystidia with fairly short rodlike projections. 47. Growing on the debris of hardwoods or pines in eastern North America, in fall; fresh gills with a greenish tinge; young cap with a whitish bloom. 47. Growing on the debris of conifers in the Sierra Nevada, in spring (often near melting snowbanks); fresh gills without green hues; young cap bald. 48. Growing scattered to gregariously on the terrestrial debris of conifers; fresh cap usually dull yellow to brownish yellow, sometimes with a greenish tinge. 48. Growing gregariously from well decayed stumps and logs of conifers; fresh cap usually yellowish green. 49. Growing in dense clusters on the deadwood of oaks from Texas to Florida; cap whitish when young, developing brownish, grayish, and orange hues. 49. Not completely as above. 50. Cap whitish, dry; cheilocystidia often forked, with long tapering projections; densely gregarious on litter of Douglas-fir in the Pacific Northwest. 50. Cap gray to black, dry or sticky when fresh; cheilocystidia not as above; ecology varying. 51. Cap dry; pleurocystidia clavate, not projecting substantially, covered with short rodlike projections; gregarious under eastern white pine and other conifers in eastern North America. 51. Cap sticky when fresh; pleurocystidia more or less fusoid-ventricose, projecting substantially; under eastern and western conifers. 52. Taste strong and unpleasant; stem tough. 52. Taste mild; stem not notably tough. 53. Edges of gills notably darker and differently colored from the faces. 53. Edges of gills colored like the faces or, if differently colored, merely whitish. 54. Cap purple to purplish brown; gill edges purple; cheilocystidia fusoid-ventricose but occasionally forked; widely distributed on debris and wood of conifers. 54. Not completely as above. 55. Mature cap very tiny (2-10 mm across). 55. Mature cap not tiny from a mycenoid perspective (5-40 mm across). 56. Growing on decaying fern fronds across North America; cap red to rose pink or grayish; gills pinkish but the faces fading to whitish with age. 56. Growing on needle beds under conifers in the Pacific Northwest; cap yellow; gills yellow to yellowish but the faces sometimes fading to whitish with age. 57. Fresh cap pink to red or orange, without brown or green shades. 57. Fresh cap olive to yellow, greenish, or some shade of brown. 58. Cap pink; gills pinkish with darker reddish edges; cheilocystidia with rodlike projections but pleurocystidia smooth and fusoid-ventricose. 58. Cap scarlet, fading to orange; gills yellow to orangish, with reddish to darker orange edges; both cheilocystidia and pleurocystidia covered with rodlike projections. 59. Gill edges orange; fresh cap olive brown with orange shades toward the margin; cheilocystidia clavate, covered with short rodlike projections. 59. Gill edges yellow; fresh cap variously colored but without orange hues; cheilocystidia as above or smooth. 60. Cap grayish olive, tinged with yellow; gills greenish gray with yellowish edges, often staining reddish with age; cheilocystidia clavate, with rodlike projections. 60. Cap grayish to brownish yellow, often tinged with green; gills whitish with yellowish edges, not staining; cheilocystidia more or less fusoid ventricose, with some branching or occasional fingerlike projections. 61. Colorful species with very specialized ecological roles: decomposing the nuts and nutshells of walnuts and hickories, decomposing the decaying fronds of ferns, or decomposing the decaying twigs and leaf debris of rhododendron and leucothoe. 61. Colorful species decomposing the litter of hardwoods and/or conifers, without such precise specialization. 62. Decomposing the nuts and shells of walnuts and hickories; mushroom bright yellow. 62. Decomposing fern fronds, or the debris of rhododendron or leucothoe; mushroom not bright yellow (but possibly brownish yellow to yellow-brown). 63. Decomposing fern fronds; cap reddish to rose pink or grayish; widely distributed. 63. Decomposing the debris of rhododendron or leucothoe; cap yellowish to brownish; Appalachian Mountains. 64. Growing in thick moss, or growing on forest litter in bogs, swamps, and other wet areas (streamsides, etc.). 64. Growing on forest litter in other hardwood and/or conifer ecosystems. 65. Cap and stem orange; cap to 15 mm across; growing scattered to gregariously in thick moss beds; spores inamyloid; gills, cap, and stem apex covered with long, fusiform to cylindric cystidia. 65. Not completely as above. 66. Cap bright orange-red, fading to orange or yellow; spores subfusiform, inamyloid; cheilocystidia without rodlike projections. 66. Cap reddish to pinkish; spores narrowly ellipsoid, weakly amyloid; cheilocystidia with rodlike projections. 67. Decomposing the debris of hardwoods. 67. Decomposing the debris of conifers. 68. Cap brick red to pink or pinkish; decomposing the debris of elm and ash in eastern North America, or debris of alder in western North America. 68. Cap some shade of yellow or orange; usually found decomposing litter in eastern North American oak forests. 69. Cap orange, fading to orangish or yellowish with a whitish margin; pleurocystidia absent. 69. Cap buff to pale creamy yellow; pleurocystidia abundant, fusoid-ventricose, with long necks. 70. Cap buff to pale creamy yellow. 70. Cap red to pink, orange, or bright yellow. 71. Fresh cap bright yellow. 71. Fresh cap some shade red, orange, or pink. 72. Fresh cap rose pink; cheilocystidia clavate, covered with rodlike projections, not projecting; pleurocystidia absent; western North America. 72. Fresh cap variously colored; cheilocystidia fusoid ventricose and smooth; pleurocystidia present; found in western or eastern North America. Several frustratingly similar species centered around the name "Mycena adonis" key out here. Microscopic features among these "species" are so similar that they generally are not informative, and subtle differences in cap color often determine identifications. To make matters worse, authors do not always agree on the species and features that separate them. 73. Growing gregariously to densely gregariously (but not clustered) on the bark of living or recently dead trees; cheilocystidia more or less clavate, covered with rodlike, fingerlike, or irregular projections. 73. Not usually growing on bark; cheilocystidia variable. 74. Spores globose to subglobose. 75. Cap purplish brown when young, but soon fading to brownish or tan; spores 9-11 µ. 75. Cap grayish brown, soon fading to grayish; spores 7-9 µ. 76. Growing on the bark of madrone; spores 9-11 x 4-6 µ. 76. Growing on the bark of western redcedar; spores 9-11 x 7-9 µ. 77. Spores inamyloid throughout development, often yellowish in Melzer's reagent; amyloid detritus not found in hymenium. 77. Spores weakly to strongly amyloid, at least when immature; amyloid detritus frequently found in hymenium. 78. Growing on the leaf litter of beech; cap tiny (1-5 mm) and white; spores almost needle shaped, 9-12 x 2.5-3 µ. 78. Not completely as above. 79. Cheilocystidia well differentiated and conspicuous; mature cap 10-30 mm across. 79. Cheilocystidia inconspicuous and basidiole-like, not projecting substantially, or lacking; mature cap 3-20 mm across. 80. Fresh cap pale creamy yellow; under hardwoods or conifers across North America; pleurocystidia fusoid-ventricose, with long necks; spores 7-9 x 3-4.5 µ. 80. Fresh cap gray to grayish; under conifers in the Pacific Northwest and northern California; pleurocystidia subcylindric or only slightly fusiform; spores 5.5-8 x 3.5-4 µ. 81. Spores cylindric to long-ellipsoid, 2.5-3.5 µ wide; on debris of conifers. 81. Spores ellipsoid, 3-5 µ wide; on debris of hardwoods or conifers. 82. Cap surface bald; pileipellis elements diverticulate with small, rodlike projections, but without pileocystidia or hairs. 82. Cap surface finely pruinose; pileipellis with well differentiated pileocystidia and/or hairs. 83. Pleurocystidia present and well differentiated, up to 60 x 15 µ. 83. Pleurocystidia absent or, if present, inconspicuous and hardly projecting, up to 25 x 6 µ. 84. Cheilocystidia and pleurocystidia widely fusoid-ventricose, to about 70 x 15 µ; pileocystidia clavate to fusoid or branched, to about 35 x 10 µ; on debris of hardwoods or conifers; east of the Great Plains. 85. Cheilocystidia absent or, if present, smooth, fusoid-ventricose to subcylindric, occasionally forking or with one or a few poorly defined projections. 85. Cheilocystidia with numerous rodlike to fingerlike projections, or irregular and branched to lobed. 86. Cap very tiny (1-2 mm across), white; growing on the debris (usually sticks) of conifers. 86. Cap 2-60 mm across, whitish (one species) or black to some shade of brown or gray; ecology varying. 87. Growing near or on the debris of ferns in western North America; cap 15-35 mm across, gray to grayish brown. 87. Not associated with ferns; cap variously sized and colored. 88. Growing directly from the wood (stumps or logs) of hardwoods or conifers. 88. Growing on the forest floor, on the debris or hardwoods or conifers. 89. Growing on the wood of conifers. 89. Growing on the wood of hardwoods. 90. Cap with grayish to brownish tints when young but soon more or less white. 90. Cap more highly colored. 91. Growing in dense clusters on conifer logs in western mountains, in spring (account for altitude), often near melting snowbanks (but also reported from Québec); lower portion of stem densely clothed with stiff whitish hairs; mushroom not notably fragile. 91. Growing scattered to gregariously or in loose clusters on conifer logs throughout North America, from spring to fall; lower portion of stem with a few flecks and hairs near the base; mushroom notably fragile for its size. 92. Pleurocystidia abundant and conspicuous, fusoid-ventricose to fusiform, to about 80 x 20 µ; cap dark brown to nearly black when young and fresh. 92. Pleurocystidia not as above; cap variously colored. 93. Growing on the wood of alder in western North America; spores 4-5 µ wide. 93. Growing on the wood of various hardwoods in North America; spores 5-7 µ wide. 94. 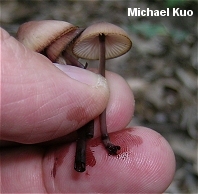 Cap some shade of brown, fading to brownish, grayish, or whitish; pinkish to reddish stains often developing on cap, gills, and stem; eastern North America; mushroom not notably fragile. 94. Cap nearly black, fading to gray; pinkish to reddish stains not developing; widely distributed in North America; mushroom notably fragile for its size. 95. Pleurocystidia 60-100 µ long. 95. Pleurocystidia, if present, under 60 µ long. 96. On debris of hemlocks and redwood in the Pacific Northwest and northern California; spores 10-12 µ long. 96. On debris of hardwoods or conifers in eastern and western North America; spores 7-10 µ long. 97. On debris of hardwoods or conifers; stem 2-5 mm thick, finely hairy; flesh firm; gill trama inamyloid. 97. On debris of hardwoods; stem 1-2 mm thick, bald; flesh fragile; gill trama amyloid. 98. Spores nearly cylindric, 9-12+ x 4.5-5 µ; under hardwoods; cap gray. 98. Spores ellipsoid; under hardwoods or conifers; cap variously colored. 99. Stem 90-200 mm long at maturity. 99. Stem 30-80 mm long at maturity. 100. Growing in sphagnum in bogs in eastern North America; stem tough. 100. Growing on debris of conifers in eastern North America and in Colorado; stem fragile. 101. Gills dark gray to gray. 101. Gills white to pale grayish. 102. On debris of Douglas-fir in western North America; gills and stem staining and bruising reddish. 102. On debris of various conifers in eastern North America; gills and stem not staining reddish. 103. Stem 0.5-1 mm thick; spores usually 7-8 µ long. 103. Stem 1-4 mm thick; spores longer than above. 105. Spores narrowly to broadly ellipsoid. 106. Cap buff to whitish, 10-30 mm across; usually growing from logs and stumps of hardwoods. 106. Cap grayish to brownish, 2-7 mm across; usually growing on terrestrial debris of hardwoods. 107. Growing on the ground from debris of hardwoods or conifers, or in sphagnum. 107. Growing from stumps and logs of hardwoods or conifers. 108. Spores 12-18 µ long; cap black to brown, 10-50 mm across; growing in bogs or in sphagnum; stem often rooting. 108. Spores 7-13 µ long; cap variously colored and sized; not growing in sphagnum; stem rooting or not. 109. Cheilocystidia with 1 to several fingerlike projections originating from the apex of the cystidium. 109. Cheilocystidia with many short, rodlike or bumplike projections originating from the sides and apex of the cystidium. 110. Pileipellis with inflated verrucose cells; cap 2-6 mm across, grayish to whitish; spores narrowly ellipsoid; growing from debris of oaks and beech. 110. Pileipellis without inflated verrucose cells; cap 5-40 mm across, variously colored; spores ellipsoid to broadly ellipsoid; ecology varying. 111. Mushroom with a long (50-150 mm) stem and small (5-20 mm) cap; cap purple-brown; on hardwood debris in eastern North America. 111. Stature not as above (even proportionally); cap some shade of black, gray, or brown, without purple shades; ecology and range varying. 112. Pleurocystidia absent; on debris of conifers. 112. Pleurocystidia present; on debris of hardwoods or conifers. 114. Pileipellis with inflated verrucose cells; cap 2-6 mm across, grayish to whitish; growing on plant debris (including fern leaves in greenhouses) or needle duff. 114. Pileipellis without verrucose cells; cap variously sized and colored; ecology varying. 115. Cap 10-20 mm across, blackish to gray with a tinge of cinnamon; cap flesh and gills often staining reddish brown; on debris of conifers. 115. Cap smaller than above (2-10 mm), variously colored; not staining reddish brown; ecology varying. 116. On litter of Douglas-fir in the Pacific Northwest; cap pale gray; spores 7-10 µ long. 116. On litter of hardwoods or conifers east of the Rocky Mountains; cap variously colored; spores variously sized. 117. Spores 9-12 µ long; cap grayish brown, becoming whitish. 117. Spores 7-9 µ long; cap bluish gray. 118. Cheilocystidia 10-20 µ wide. 118. Cheilocystidia 5-12 µ wide. 119. Cap some shade of brown, fading to brownish, grayish, or whitish; pinkish to reddish stains often developing on cap, gills, and stem; eastern North America; mushroom not notably fragile. 119. Cap nearly black, fading to gray; pinkish to reddish stains not developing; widely distributed in North America; mushroom notably fragile for its size. 120. Cap, gills, stem, and flesh staining and discoloring reddish; widely distributed in North America. 120. Surfaces not staining reddish; western North America. 121. 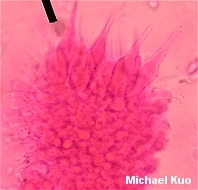 Cap 10-20 mm across; stem 20-60 x 1.5-2.5 mm; spores 7-9.5 x 4-5.5 µ. 121. Cap 25-70 mm across; stem 50-120 x 4-8 mm; spores 8-10 x 5-7 µ.
Breitenbach, J. & Kranzlin, F. (1991). Fungi of Switzerland: A contribution to the knowledge of the fungal flora of Switzerland. Volume 3 boletes and agarics 1st part. Transl. Walters, V. L. & Walters, J. F. Lucern: Verlag Mykologia. 310 pp. Desjardin, D. E. & Bessette, A. E. (1997). A new Mycena from New York. Mycotaxon 62: 299-303. Malysheva, E. F. & Morzova, O. V. (2009). Notes on Hemimycena from European Russia. Czech Mycology 61: 27-71. Moncalvo, J. M., R. Vilgalys, S. A. Redhead, J. E. Johnson, T. Y. James, M. C. Aime, V. Hofstetter, S. J. W. Verduin, E. Larsson, T. J. Baroni, R. G. Thorn, S. Jacobsson, H. Clemencon & O. K. Miller Jr. (2002). One hundred and seventeen clades of euagarics. Molecular Phylogenetics and Evolution 23: 357-400. Perry, B. A. & Desjardin, D. E. (1999). Mycena californiensis resurrected. Mycotaxon 70: 87-97. Smith, A. H. (1947). North American species of Mycena. Ann Arbor: U Michigan P. 521 pp. An online version of this book is available here, at the University of Michigan.